Loved for its combination of classic oak with a distinctly contemporary outlook, the Henley’s ability to look homely and yet a little regal at the same time has won it a big fan base. Now the designers at leading lifestyle and interiors brand Neptune have created a whole new Henley kitchen aesthetic. Echoing the classic style and shape, the improved version still embodies the Henley spirit, but by adding tulipwood Neptune is now playing with colour. Their new crisp and cool snow shade works well with Henley’s oak and their new black-bronze hardware. And the latest version offers even better functionality, with Neptune having made more than a thousand updates and upgrades to their Henley kitchen collection. There are the 12 new cabinet creations from broom cupboard to never-before-seen larder concepts. Among them is a cabinet counter top bi-fold mechanism only available with the new Henley. When open, the doors concertina to take up minimal room and its open-base design allows you make the most of your work surface space. Part of Henley’s signature is Neptune’s newly developed black-bronze hardware. From door handles to drawer dividers, its matte appearance provides a strong contrast to Henley’s oak and snow. Then there is Neptune’s brand-new high-performing Dekton work surface option. Dekton is a new-generation material that is so hardwearing you can place hot pans directly on top. 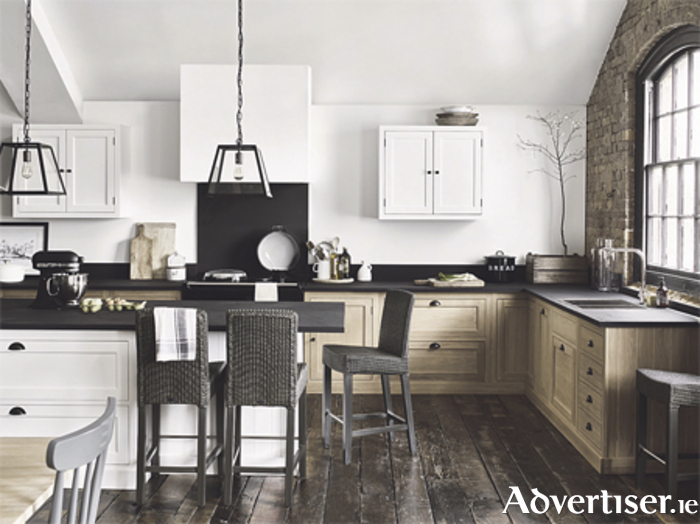 It is also very good looking, with sultry black tones and a subtle texture perfectly complementing Henley’s oak and snow shades. From classic to contemporary, Neptune’s new look Henley kitchen can translate to each end of the style spectrum and is yours to enjoy. See www.neptune.com for Irish stockists.